Last April I started playing around with Twitter, but I didn’t really get into it until July after Adam showed me Twitterific by Iconfactory. I gave up on getting Twitter to work with IM and my cell phone and started tweeting through Twitterific exclusively. I’ve been filling it with thoughts, annoyances, personally directed (but not private) messages, and links, several times a day, and my IM and Facebook status messages are set to my twitter url pretty much all the time these days. The Twitter application for Facebook is one of the few that I use and I’ve tried and failed to get Twitter Tools to work with WordPress 2.3.1 so I could have my tweets cross-posted here as well. I recently upgraded my WordPress installation (it was way way way out of date) and I thought it was weird that my old plugins weren’t showing up after the upgrade. It turns out that when I tell Transmit, the most convenient mac ftp application that I’ve found to date, to replace a folder, it deletes the old one and replaces all of it’s contents with the folder I’m uploading. This makes perfect sense in terms of the english language, but it’s not at all how I expect things to work based on years of ftp experience. 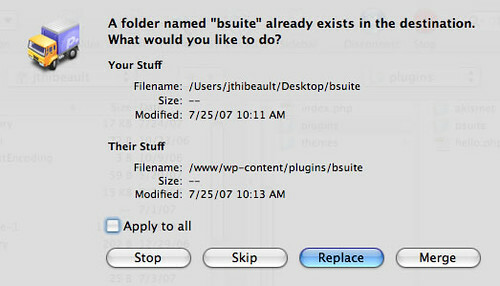 In Transmit, if I want leave subfolders and files that aren’t on my local copy, I have to choose merge. Lesson: be careful with “apply to all” check boxes when playing with new software. I installed Acrobat CS3 on my Macbook for testing at work. I did experience the firewall-turning-off issue, but I also had another issue crop up. When opening .PDFs in Safari, rather then the the document opening up in an embedded version of Preview, I was getting a dialog asking me what application to use to open the PDF (which unfortunatley had preview grayed out). I suspected Acrobat was the cause of the problem, so I opened Acrobat and was greeted with a dialog asking if I wanted to make Acrobat the default application for opening PDFs (I said “no”, but it didn’t seem to take notice). After this, I restarted Safari, and just got a spinning icon in the middle of Safari when I try to open PDFs. I went back to Acrobat and unchecked the “Display PDF in browser using:” option in the Internet category. 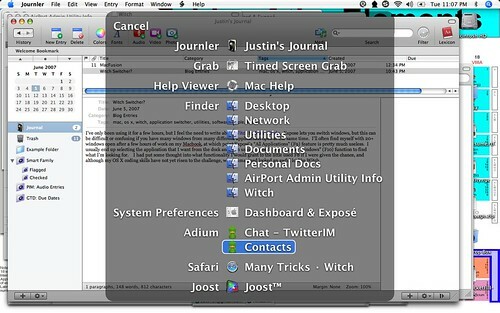 I quit Acrobat, relaunched Safari, and everything was back to normal.